To understand how the town of Pleasant Valley came about, one must go back to 1846 and a place two thousand miles east. Brigham Young and his followers were in dire straights, having left much of their belongings in their flight from Nauvoo, Illinois and persecution. They, the Mormons, had arrived in Council Bluffs, Iowa with little of anything. President James K. Polk, concerned with the safety of all people migrating west, proposed a string of forts be built along the way to protect them. Brigham Young figured his followers could benefit by being involved in this task, since it would provide the badly needed supplies for their migration west. He sent Jesse C. Little to Washington D.C. to discuss the matter with the government. Before Little arrived there, war with Mexico broke out and Polk proposed that instead his people form a battalion to help conquer California. Five hundred and thirty-six enlisted on July 16, 1846 and the Mormon Battalion was formed. Under the command of Captain James Allen and later Colonel P. St. George Cook, the Battalion worked their way west and on January 30, 1847, the group, ragged, fatigued and hungry, arrived in San Diego, having built a 2000 mile wagon road along their route. On July 16, 1847 the battalion was mustered out at the Pueblo de Los Angeles. Some reenlisted, but the rest, having found out about Sam Brannan (one of the Mormons who had come west by ship) and his settlement at New Hope Colony (near today’s Lathrop), headed north. On their way they learned that Brigham Young had selected Salt Lake City as the future home for the Mormons, so the main body of the group turned east and headed there. On the way they met Sam Brannan, who was returning from Salt Lake. He informed the group that there was little food or supplies in Salt Lake and that Brigham Young wanted those without families there to return to California and acquire clothing, stock and provisions for a trip the next spring. About half of them turned back, the rest continuing eastward. Of those who arrived back at Sutter’s Fort, some went to work on Sutter’s grist mill at Natomo (Natoma?) and some proceeded to Coloma to work on the sawmill that James Marshall was building. A lot has been written about what happened from there, the gold discovery, the secret getting out, and the mining at Coloma and Mormon Bar, but rather than revisit that subject here, we will skip forward a several months. On May 1, 1848, the Truckee Route being still impassible due to snow, the Mormons chose eight men as an exploring party to search out a new route over the Sierra Nevada. The eight, Ira J. Willis, James C. Sly (Sly Park is named for him), Israel Evans, Jacob G. Truman, Ezra Allen, J. R. Allred, Henderson Cox, Robert Pixton and their Captain, Daniel Browett, arrived at Iron Mountain three days later and found more deep snow. They postponed their explorations and spent their time panning for gold, obtaining wagons, and gathering supplies and cattle. On the 17th of May, Henry W. Bigler, one of the men who had been at Coloma when James Marshall discovered gold, arrived with two companions at a valley about eight or nine miles south of Old Dry Diggings (Placerville). They called the place Pleasant Valley, and designated it as the gathering place for the return to Salt Lake City (because of this, for a few years Pleasant Valley would show up on maps as Mormon Camp). By June 21, 1848 other members of the Battalion, including some of the original exploring party, had arrived in the valley. A few days later, three of the exploring party, Browett, Allen and Cox, again set out to find a new route over the mountains. On July 3, the main body left Pleasant Valley heading eastward following the trail blazed by their companions. 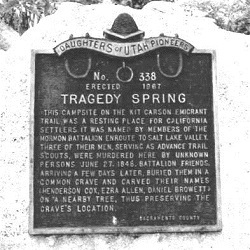 At a place that would be called Tragedy Springs, they would find the bodies of Browett, Allen and Cox, supposedly killed and buried by Indians some weeks earlier. The group would properly bury the three before proceeding and, on September 29, 1848, reach Salt Lake City, having blazed a new wagon road across the Sierra Nevada to the Carson Valley. Because the Mormons used this route to emigrate from California, a portion of this route would ultimately be named Mormon Emigrant Trail. As more and more people entered California along this route, to Pleasant Valley would come growth and at one time the valley would have a population near ten thousand. In 1862 the Pleasant Valley School District would be organized and a one-room schoolhouse built. This District would continue to operate until 1958 when it and other small districts were combined into the new, Gold Oak District. On March 23, 1864 the Post Office would open with John B. Hass as Postmaster. It would remain open until the last day of December in 1917, when the Placerville Post Office would take over the mail delivery. With the decline in the number of immigrants and the reduction in mining, for the next hundred years or so Pleasant Valley would be a small business area, surrounded by farms and ranches. By the 1970s, farming and ranching would generally be in decline. But soon, several more business would move into the area and hope for the future of agriculture would come in the form of the first of many acres of vineyards that would be successfully planted in and around Pleasant Valley. Sources for this story include: “Mormons and the Discovery of Gold” by Norma Ricketts (1966), “Short Stories Regarding the History of South El Dorado County” by D. A. Wright (1998); “The Historical Perspective Supplement for the Pleasant Valley, Oak Hill, Sly Park Area Plan and Environmental Impact Report” by George W. Peabody (3rd Edition, 1995); “History of California Post Offices, 1849-1976”, researched by H. E. Salley (1976); “History of California”, by Theodore Hittell (1897); “California Gold Camps”, by Erwin Gudde (1975); “California Place Names”, by Erwin Gudde, 3rd Edition (1974); “Mother Lode of Learning – One Room Schools of El Dorado County” by Retired Teachers Association of El Dorado County (1990); “I Remember…, Stories and pictures of El Dorado County pioneer families”, researched and written by Betty Yohalem (1977); “History of El Dorado County”, by Paolo Sioli (1883), reprinted and indexed by the El Dorado Friends of the Library (1998); and the wonderful people at the reference desk of the El Dorado County Main Library.